When it comes to looking for the cooler that best suits you, some brands go far to ensure that they have your attention with crazy features that end up leaving you with an empty wallet. While it’s great to have an ice chest that can light up in the dark and use speakers to play songs, it’s sometimes best to stick with an option that has a balance between price and capability. That’s where Frosty comes in, as this brand provides a price that is affordable for the average joe and does what it needs to so that whatever you carry inside is in the right condition for your needs. Frosty Coolers may not bring anything new or revolutionary to the table but it does what is intended to, and we have to admit: it does it well. 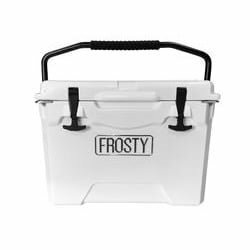 If you’re looking for an ice chest that saves you money and trouble with its operation, then read on with our Frosty Cooler review. Having a cooler that can keep from being damaged and handle the worst of weather conditions is a must if you want to enjoy drinks and food at a special event, whether it’s a barbeque over the summer or a get-together for the Superbowl in the winter. Thanks to their roto-molded design, Frosty’s ice chests guarantee that they won’t have any dents or scratches during bad weather or if you accidentally drop it or knock it over. Don’t plan on getting a new Frosty ice chest anytime soon, either, as the construction will keep this cooler in great condition for years, saving you a good deal of money, as well. The exterior has a no-sweat design so that it stays dry on the outside no matter the situation. TIP: To see other rotomolded coolers worth buying, read this post. 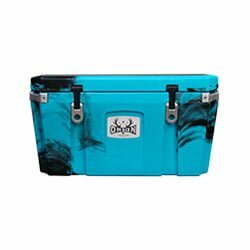 If you want to have an easy time carrying your cooler to the beach, lake, house or whatever setting you plan on having for your get-together, consider what Frosty cooler has to offer in carrying options. Features for this situation include the top handle for the Frosty 25, which is the smallest option that this brand has to offer and is perfect if you are carrying light. The heavy-duty rope handles, on the other hand, are reserved for the rest of the company’s options. 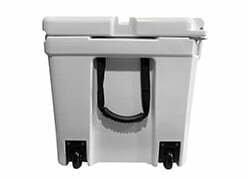 If you have a lot to bring and prefer an ice chest that you can avoid carrying, then you’ll be happy to know that the Frosty 75 Wheeled cooler will only require that you pull or push it. All options also come with molded side handles to make them easy to lift, whether you’re doing it on your own or have a friend helping you. Making sure that your drinks and food are ready for people to enjoy and that the ice doesn’t melt is a priority for all cooler owners, and Frosty ensures that you never have an issue in this area. 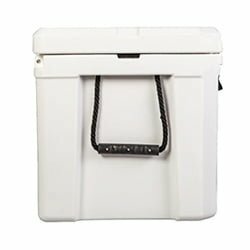 This brand’s premium ice retention cooler comes with commercial grade foam insulation that helps ice last for several days, which can come in handy for campouts and vacations. 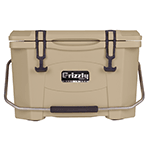 This ability has gained Frosty a great deal of praise in online reviews, with some users talking about how they were able to keep drinks and fish cold in their cars and trucks in the hottest of summer days and night. Another guarantee for long-lasting ice is the lifted base, which comes in handy if you want your cooler to stay away from a hot ground. The easy flow drain spout helps you avoid draining ice while getting water out of the cooler. 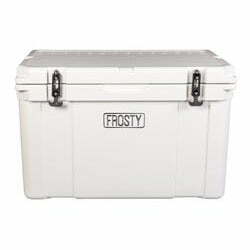 Frosty ensures that you don’t have to worry about anything falling out of your cooler and that everyone has an easy time getting what they need from inside. The ice chests’ no-slip feet keep them from sliding in wet conditions so that it doesn’t fall over and it doesn’t knock anyone’s feet out from under them. The heavy-duty rubber latches make it easy for you to close your cooler when you’re done filling it up or taking something out. 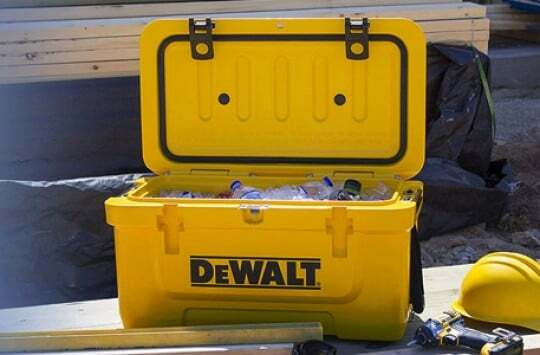 Thanks to the molded tie-down slots, the cooler will stay anchored wherever you place it. We found top lid easy to lift, thus making it easy to get your hands on whatever drink or snack you want inside, and the metal rod hinges interlock to make sure that everything stays together. The most successful cooler brands are those that offer a variety of size options, depending on how much you plan on or prefer to bring to events. 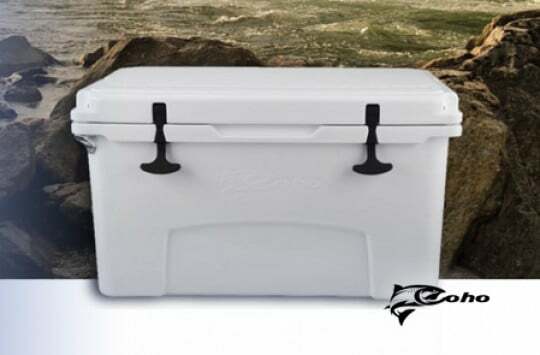 Frosty cooler is a reliable option when it comes to this category, as it has ice chests fit for whatever amount of items you plan on carrying. The smallest option is the Frosty 25, which has an inner dimension of 14 in. X 8.5 in. X 11 in. and an outer dimension of 20 in. X 13 in. 15 in. 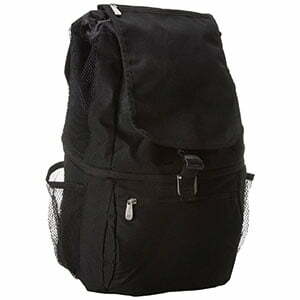 It weighs 25 pounds, making it easy to carry, and can hold up to 20 cans of soda or beer. 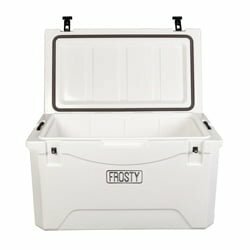 The company’s biggest ice chest is the Frosty 120, which has an inner dimension of 30 in. X 17 in. X 16 in. and an outer dimension of 35 in. X 22 in. 21 in. This option weighs 125 pounds and can hold up to 120 cans for those crazier parties. More options in between these sizes are also available in case you have different plans. This brand only comes with white coolers, which may be a downer if you’re looking for options with different colors. However, if appearance is less of concern of yours compared to functionality, then this shouldn’t be a problem. 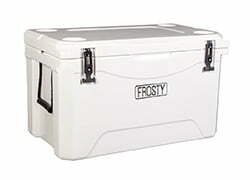 Frosty’s coolers are warrantied against defects in material and workmanship for one year. While this isn’t as long as warranties for Yeti and Pelican, which are five years and a lifetime, respectively, it is just as much as that of RTIC and some of the other coolers like Yeti. The warranty for Frosty’s ice chests is void if you alter their structure or use them commercially, as well as if they take damage beyond their limits. You also won’t have a warranty for normal wear and tear. 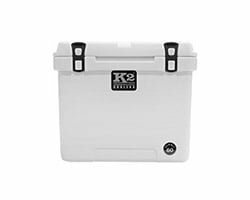 Sticking with a well-known brand is a common tendency when it comes to buying any new product, and that is usually that case when it comes to getting a new cooler and choosing Yeti’s options. However, despite having a shorter warranty and fewer color options, Frosty has benefits that are more up the alley of those trying to save a buck. 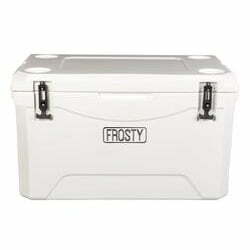 The Frosty 25 cooler is the brand’s cheapest individual offering at $129.99, while the Frosty 120 is the most expensive one at $319.99, as per Frosty’s website. 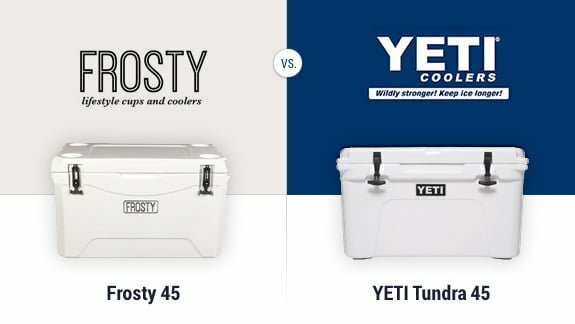 Yeti is – yes you guessed it right – significantly more expensive so if you’d opt for a Yeti then be prepared to pay about 40-45% more for a similarly sized cooler. 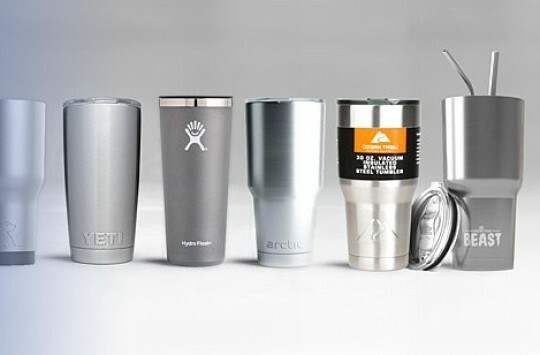 When it comes to accessories, Frosty has a slight edge over Yeti in variety. While both brands come with lids, gaskets, handles and latches, Frosty also provides trays, dividers and cutting boards that help you keep different items separate and easy to access for everyone else at get-togethers. Hats and T-shirts are also available if you really want to show support. 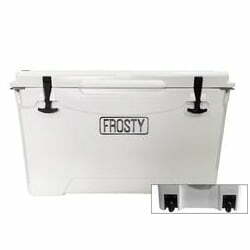 In the end, Frosty cooler is a great fit for those looking for a simple, affordable cooler. Yeti does a great job at keeping items in prime condition, but Frosty will definitely spare your wallet while offering a variety of sizes and functioning just as well. If you’re looking for simplicity and convenience, Frosty takes the cake. Frosty Coolers For Sale – Where to Buy? If you’re looking for a reliable online retailer that is home to a variety of items ready to be purchased, then Amazon is right up your alley. In case you’re having second guesses about getting Frosty’s ice chests, there are plenty of reviews from actual users available to give you a second opinion. There’s always the option to return your purchase in case it doesn’t end up performing to your standards, and Prime members will have access to free shipping and additional benefits. 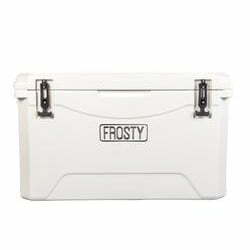 You also have the option of going to Frosty’s website to buy your cooler in case you want to check out the validity of the brand. All individual and two pack offerings are available, and last time we checked accessories ranged between $14.99 and $34.99. Sometimes, all you need to find the perfect ice chest is simplicity and functionality. Relying on bigger brands with extra features isn’t always the best way to go about choosing a cooler that fits you, and Frosty does an excellent job at being affordable and reliable at the same time. You won’t need to spend as much compared to more popular brands, and the features are designed to keep your food and drinks cold for days, making this choice perfect for vacations and long get-togethers. Sizes vary depending on what you plan on bringing with you, and the construction keeps these ice chests prepared for anything. The next time you’re in need of a cheaper cooler for a friend’s birthday or the big game this weekend, give Frosty’s coolers a shot. I am really pleased to read this blog posts which contains tons of helpful data, thanks for providing these information. Good luck getting your order if you order a Frosty and if you do not get your order you will not get any response from customer service. Stick with YETI. Check out the complaints on BBB and you will see this is a common occurrence.